Yay, it's outdoor painting season again! 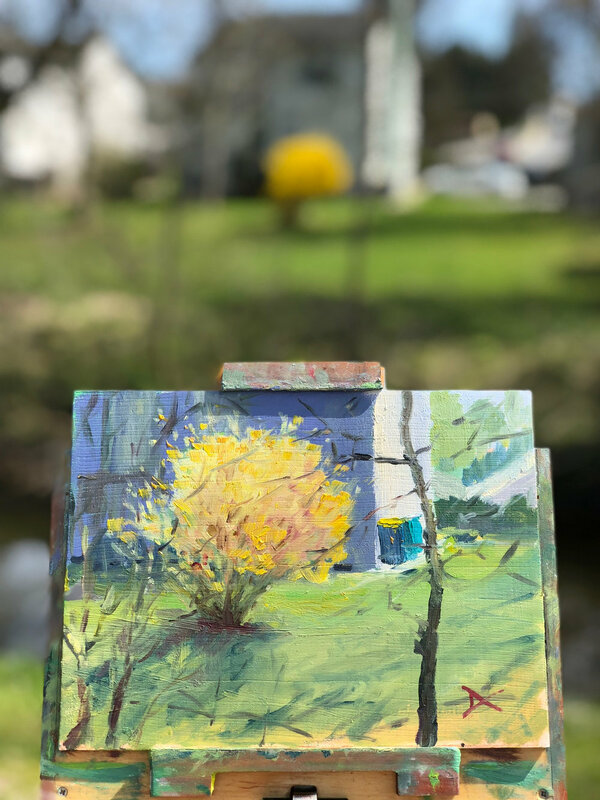 Finally out of the winter rut and gradually pushing myself to return to a plein air painting routine. Perhaps not always productive, but at least I'm doing something which usually gets my creative juices flowing again. When I go out to paint, I can't seem to venture farther than a few blocks from my studio to paint, but the previous day was an exception. I rode my bike into town to paint with another artist friend, Sarah Yaoman, outside of a local art gallery, Square Pear Gallery. I had to remind myself to not get distracted because it's nearly without fail, whilst heading off to where ever destination was in my mind, I'd always become distracted by something to paint. Today, I gathered my gear, opened the front door and saw my neighbour's napoles patch. The sun was peeking in between clouds, but I got a quick glimpse of how the sun was lighting the edges of the cacti. It was one of those ooh-nice! moments. Oil on panel, 11 by 14 inches. Oil on panel, 8 by 6 inches.